There are still more beach panorama should not miss when you come in in the area of Malang, which Beach Tamban. Tamban beach located next Sendangbiru is located not too far to the Sendangbiru beach. Precisely Tamban beach located in the village or the village pond Rejo Tamban, District Sumbermanjing Wetan. Tamban coast in great demand because of white sand and rocks are scattered along the coastline is still very natural and suitable for the visit. 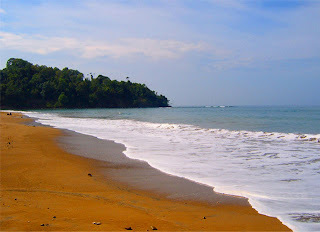 From the beach Tamban and also could see the sparkling beauty of the island Sempu sunlight. Not far from the beach there is also a beach Tamban that you can try visiting the beach Senidiki. The area is still very beautiful beach and lots of foreign and domestic love Senidiki Beach. there for those of you who like to surf waves you can try that suits you conquered. Waves crash because there is still quite large for surfers. Besides there you can also do other activities such as: snorckling, diving, swimming and other activities you can try the exciting Tamban Beach or Beach Senidiki. (c) 2018 Info Malang Tourism.